The number of sacred music books has been greatly multiplied within the last few years. 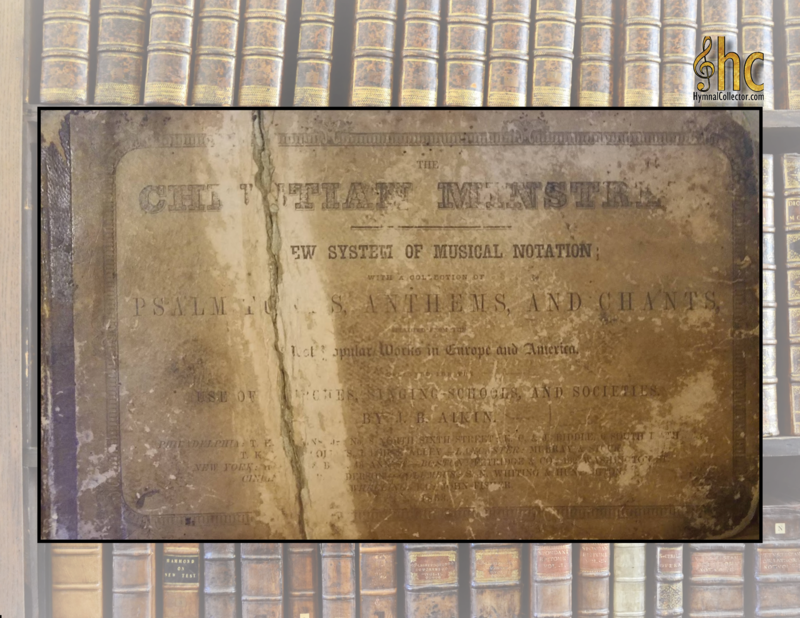 Mason’s publications alone have furnished the churches with a rich variety of music, arranged and harmonized in a style of unequaled beauty and sublimity, and characterized by a chasteness, simplicity, and facility of expression, and all that is adapted to dignify and elevate the character of devotional song, which must commend it to the hearty acceptance of the most intelligent and best cultivated minds in the world. And from the number of editions of these publications, which have succeeded each other in rapid succession, and which have been anxiously sought after and liberally distributed throughout the country, it seems fair to infer the existence of a happily increasing interest in the subject. The fact, also, that the unscientific and trashy publications which but too lately were held in high popular estimation, and which supply the churches, especially of the south and west, with nearly all their music, are now being in a great degree displaced by those of a more serious and scientific character, indicates the decided improvement in the popular taste. It is a singular fact nevertheless – and one which demands the serious consideration of the friends of music, and which it concerns teachers and guides in the science to account for – that by far the largest portion of the community are all together unacquainted with the elementary principles of the science, and have no use for written music whatever; and this is the case, not only among the ignorant and unlearned, but among the more enlightened and educated portions of the community. Even among members of the church, a very small minority are able to distinguish one note from another, and two-thirds of the ministers find it more difficult to sing the plainest tune unaided, without having first heard it, then to write a sermon. And I must add, though I regret the occasion which requires it, that of the classes that receive the instructions of our most scientific and devoted teachers – however they may seem what they have learned by the hearing of the ear – not one half are even able to read and comprehend the simplest passages in the books. Whence, and how is this? Do the people feel no concern upon the subject? Have they no desire to understand the science, or to acquire the art? Or have our guides been at fault? Have they left the simple path of nature, and constructed a road less inviting and more intricate and difficult? Multitudes, – often those of the first order of intellect, who cannot be suspected of a want of energy equal to any enterprise, – are heard to say daily, how much they would give to be able to sing by note. They have paid some attention to the subject, but a mist seem to hang over it. They have, perhaps, entered upon the study with earnestness and zeal, but the first results were unsatisfactory, and the difficulties in attaining any thing like an accurate knowledge of the subject appeared insurmountable, with the time and labor which they were prepared to bestow. The fact is notorious, and these deplorable results follow the most improved system of Pestalozzian analysis. These results are by no means owing to any want of ability or zeal on the part of those engaged in instruction. The energy and untiring perseverance of those who have for some years past devoted themselves to the business of instruction, and to the preparation of music-books, are worthy of all praise, and command our highest admiration. But with the experience of the past, and a just observation of the present, it requires not the gift of prophecy to foretell, that while the same system is continued, no efforts to extend the boundaries of knowledge in this department of science, however energetic and well directed, will succeed in any degree adequate to the wishes and expectations of its friends. A radical reform in the mode of writing music is what is required. We must cease to inoculate as elementary principles mere dogmas, arbitrarily imposed upon us by those who have gone before. We must make no factitious distinctions where there are no differences. I have bestowed much time and consideration upon the subject, having had the experience of a number of years in teaching. I have looked at the subject again and again, impartially and independently, as far as possible without reference to existing theories, and uninfluenced by the settled opinions and interesting systems of others; and though conscious that I must hazard the imputation of vanity and presumption, I have injured to offer to the public a “new book,” presenting the subject in a shape less complicated, more simple, and as I conceive more in accordance with nature. I respectfully ask of musicians a careful examination of this work, and a careful consideration of the particulars in which it differs from others, and which I cannot but believe they will agree with me in denominating improvements. As music is ordinarily written, the varieties of measure amount to some nine or ten. Professor Mason says in his Carmina Sacra, page 7, “Other varieties also may be used,” even as many as fifteen or more. In this work only three varieties are used, equal, unequal and compound. The reasons which induce this change, and the claims it has to be considered as an improvement in the mode of writing music, may be estimated from the following considerations. First, other varieties are not necessary. Every variety of music may be written intelligibly in one or the other of these three measures – equal, unequal, or compound. All sounds, of whatever relative length, and in every possible combination, maybe clearly represented to the eye without the use of any other. We sometimes find the same music written in different varieties of measure in different books, (and those, sometimes, by the same author,) and when a choir happens to be supplied with a variety of books, they are not unfrequently found singing in good time, and together, the same music, each unconscious that one is singing half-notes and another is singing quarters. Third, these multiplied varieties are not only unnecessary and useless, they are positively injurious, and only tend to involve the subject in difficulties. “The most important requisite in all good performance,” says the respected author quoted above, “is accuracy of time. – To acquire the habit of keeping good time requires much patience and perseverance; and it is in this that those who commence learning to sing are most likely to fail.” Nothing is more true, as the experience of every teacher will testify. But is it strange? Can it be otherwise, when the theory and the practice are so directly at variance? The acquisition of the art must be difficult when the theoretical instruction is so lumbered up with distinctions, without any essential differences. Much time and labor are spent in acquiring a knowledge of the many varieties of measure, as indispensable to the keeping of time; but when the pupil comes to practice, he finds that nearly all these varieties which have been so distinctly pointed out to him, are only such theoretically, and on paper; they are varieties to the eye, but in fact, and to the ear, they are the same. The eye readily perceives the distinction, but the ear cannot discern the difference. The measure of the eye and the measure of the ear do not agree. Each organ loses confidence in itself or in the other; nature is divided against itself – a conflict ensues – an appeal is made to the books, and each claims the victory; for, “to the eye they are different, to the ear they are alike” – each organ charges the other with deception and falsehood, and the poor people with “confusion worse confounded” despairs of ever finding “patience and perseverance” to carry him through the labyrinth of time. But the evil may be rendered still more intelligible to all, and the advantage of the improved method will be fully justified by considering another particular. “Every person learning to sing should give strict attention to beating time. Experience proves, that where the habit of beating time is neglected, the ability to keep time is seldom acquired.” Such is doubtless the fact, as all teachers must know. To keep time, we must beat time, and when one mode of each measure only is used, correctness in keeping time is soon attained. The habit is soon form of appropriating one beat to each half note, or its equivalent, whether in equal or unequal measure. This is the method adopted in this work. The music is so written that the measure and the counting, or beating, are always the same, whatever maybe it’s character; and the habit once formed is never to be changed. To this most common mode of time teachers generally first introduce their pupils, and all is well until a variety is introduced; and the patience begins to be tried. The habit sedulously cultivated, and already well formed, is now to be directly contravened; and instead of appropriating a beat to each half-note, and one to two quarters, each quarter claims its beat, and the half-note two. The difficulty is not in giving a beat to each quarter, or two beats to the half, but is produced by the breaking up of a fixed habit, and the formation of another, which is so directly the opposite of the first. The more fixed and decided the first habit, the better is the pupil prepared for the performance of the first mode; but the formation of the second is proportionately difficult. This much is at length accomplished; then the pupil is put back up on his trials in the first measure, and he finds, to his discomfiture, that the second habit as almost displaced the first, and so he must address himself to that again. This, however, is only the beginning of his troubles; he must go through all the varieties, learning and unlearning, advancing and retreating, forming habits and again effacing them from his mind, to make room for the formation of others – forgetting as far as possible the first, in order to embrace the next; and forgetting the last in order to remember the first. Surely much patience and perseverance are required in such a work as this; and yet it is a labor which satisfieth not – nothing whatever is gained by it. The method of writing music, adopted in this work, avoids all the evil, and accomplishes every purpose that can be needed or desired. The same general considerations which were offered in reference to the varieties of measure, may with equal propriety and force be urged against the usual distinction of major and minor scale, or major and minor mode. There is no ground for such a distinction in nature – such a distinction is not necessary. It answers no practical purpose whatever; and it is very difficult to conjecture why it was invented, unless it were to confound the uninitiated, to puzzle the student, and to involve the whole subject in mystery. The natural scale, with the sharp fourth, fifth, &c., contains all the sounds and all the intervals that can be furnished by the artificial minor scale. Every conceivable variety of music, bold and cheerful, soft and plaintive, may be written upon the natural scale. All music is in fact written upon it. The minor scale itself (so-called) is founded upon it, or more properly is not really anything different from it. The minor scale, it is evident, is neither more nor less than portions of two octaves of the natural scale – commencing with the sixth the octave below the key, and ending with the sixth in the octave above. It is a part of the scale embracing such a proportion of half-intervals, as to secure a plaintive effect, and when a certain amount of this plaintiff influence is introduced, it has been called the minor scale, or minor key. But why object to it? Because it is a distinction without a difference. We might, with equal propriety, commence a scale with the third, another with the fourth, another with the fifth, and so on, and name them from the peculiar musical effect – the sub-major where the tune is half as plaintive as the minor, and the super-major where the effect is particularly cheerful. But the objection to this distinction is not merely that it answers no valuable purpose. Its effect is to produce confusion in the mind, and to hinder the progress of the student by introducing two keys into the theory, and fixing a double set of numerals to precisely the same sounds and syllables. The key, or one, of the natural scale, is the basis or governing sound: it governs or determines the pitch of all the other sounds in the scale. It is of the first importance that the key, and the relation of other sounds to it, and their dependence upon it, be well understood and firmly fixed in the mind. Hence all authors and teachers are obliged to devote special attention to the exposition of this point, and to the practice of singing the scale by numerals, by skips, &c.; and this must be persevered in until, the key being given, the learner can with ease produce any sound of the scale when designated by its numeral. “It is very important, and we repeat it, that the situation of the tones and semitones be firmly fixed in the mind of the scholar” (Mason’s Manual, 110). In this work the minor key is not reckoned as belonging to the principles of the science; and by its entire exclusion, deceptive distinctions are avoided, the subject is divested of some of its mysteries, and presented in a manner at once natural, simple, and intelligible to all. By this arrangement, a great advance has been made towards simplifying and reducing to a more complete system the mode of writing music for the various classes of voices, and for various instruments. Heretofore the letters upon the staff have been located variously for the treble, the counter, and the bass. The C clef, indicating the position of the letters on the alto staff, has of late years, however, gone nearly out of used in this country; and modern authors generally letter the alto staff in the same way as that of the treble. This was one step towards reform – rendering the subject less complicated, and easing the art of reading music of one of its unnecessary burdens. In this work, the use of the clef is entirely dispensed with, the new lettering of the treble staff rendering it perfectly convenient to write all music, for the bass voice as well as for bass instruments, on the same staff, or one similarly lettered. Thus, the central G of the bass voice is fixed on the center of the staff, and perfect uniformity is attained in the mode of lettering of the staffs for all the parts in which music is written. Teachers will be able to appreciate at once the advantage gained by this arrangement. It supersedes entirely the necessity of introducing into their lessons of instruction, all the scales based upon the F clef, or bass staff, and relieves them of further concern in regard to just one-half of that half which remains after the carrying away of the fourteen by the exclusion of the so-called minor-key. And the pupil will find his mind no longer confused by the various positions of seven letters; and his memory burdened with endless distinctions. But having mastered the seven scales, based upon the seven letters occupying seven fixed places on the staff, he will find his way short and comparatively easy, without being required to retrace his steps or to cross his path. Much might be said in favor of this mode of writing music, and much will readily suggest itself, especially to the instrumental performer, to whom alone it will be an immense gain, but further remark here is unnecessary. Those concerned, and the public, will judge for themselves. The signature ordinarily used, consisting of flats and sharps at the commencement of a tune, indicating the position of the key, has been laid aside, and its place supplied by the use of the word key itself. This mode of designating the place of the key has been adopted as being more simple, and less liable to miss construction than the use of the flats and sharps. It is well known to all musicians, that the flats and Sharps at the beginning of it tuned are not designed to affect the voice in any manner whatever. The singer has no concern with them – except so far as they serve to indicate the place of the key; and yet it is amazing how many persons – who are by no means entire strangers to music books – have utterly misconceived the design of flats and sharps when used as a signature, and have supposed that they really affect the character of the music to which they are prefixed! – that the flats and sharps fix the place of the key, etc. Now, as the key constitutes a sufficient and most intelligible signature; and as the performer on instruments, to whom alone they can be of any possible service, should make himself thoroughly acquainted with the rules for performing each scale, and is supposed to know immediately when the key is given, what letters are to be played flat or sharp: these characters have been entirely excluded from the signature, and the direct method of signing the key has been adopted. To the organist, and to the performer on the piano, the advantages of this method of lettering the staff will be incalculable. The labor of the pupil will be comparatively trifling. Every teacher knows that when the pupil has the position of the letters of one staff, and their relation to his instrument once fixed in his mind, he is, according to the method heretofore adopted, immediately perplexed to find that C in the first staff is not C in the bass staff, but E; that the central line of one staff is B, and the central line of another is D; in short, that the letters of both and their relation to the instrument, conflict throughout; and all this while the octaves on the instrument are exactly alike. Anyone can, in some measure, appreciate the difficulty which consists not so much in learning the position of a number of letters, virtually amounting to 14 – which would be objectionable enough, since it is unnecessary – but in distracting the mind by the use of two staffs, so much alike, and yet so much unalike. Upon the method here adopted, when the pupil has mastered one staff, he has accomplished all in this department. The author designs, should the present work meet with public favor, in accordance with the repeated solicitations of many teachers, to publish a work on this plan expressly for the pianoforte. The system of seven syllables used as names for the different notes in the octave, now so deservedly popular in every part of the world, has been adopted in this work. Nothing is more easily demonstrable than the superiority of this to the four-syllable system. For, if anything at all is gained by giving names to the sound of the octave – and of this there can be no question – it is easy to perceive that the nomenclature which appropriates to each sound in the octave a distinct name, must have the decided advantage over that which requires the same name to be applied to different sounds. On this plan, the association of the name and the sound – which is the great object designed in the use of names – is necessarily more complete; and universally, where this system is adopted in singing schools, the intonation is much sooner formed. But this work differs from all others in the use of seven figured notes, each of a peculiar shape. Every singer knows how difficult it is to learn to apply the seven syllables to the notes all of one shape. The learner must know whether the note is doe, ray, or faw, by the lines and spaces on the staff. This he must learn in all the seven scales: for example, in the key of C, or in the C scale, doe is on C, ray on D, me on E, &c. And in the key of A, doe is on A, ray on B, me on C, &c. In short, in the seven scales, doe, as well as every other syllable in the octave, is on every line and space on the staff. The system adopted in this work will be found to have the double advantage of giving to each sound its own name, and to each note or name its own form. As seven different syllables, or names, are used for the purpose of attaining the seven different sounds in the octave with greater facility; so seven different figures, or forms, are used for the purpose of obtaining the names immediately and with perfect certainty. The key, and the name of any note, and also its pitch and relation to the key, as well as its length, are all written and clearly presented to the eye of the reader by the figured symbol. The name, the shape, and the sound of a note, and its relative pitch, are thus perfectly associated. The round notes teach nothing which is not taught by the use of the seven figured notes. But the figured notes do teach what the round notes do not. The musical ideas are the same, whether the notes be round or figured. But as the ideas are expressed unambiguously, and with equal precision, and, withal, and may be read with greater facility when written in figured notes, seven characters are used in this work as best adapted to increase the number of readers of music. The peculiarities above specified embrace the chief characteristics of this work, and constitute its principal claims to public patronage. Whether to them shall be awarded the merit of being considered improvements, must be submitted to the decision of a liberal and enlightened community. The vain design of thrusting before the world useless innovations upon the established principles of science, and of making unnecessary inroads upon the customary modes of instruction, has had no share in getting up this work. With the firm conviction that the science, as ordinarily presented in the books, might be divested of some of its mysteries and subtleties, and a sincere desire, if possible, to contribute something towards multiplying the number of those — alas! now too few — who shall be prepared to lift up their voices in harmonious strains of praise to Him before whom “the morning stars sang together,” the editor has done what he could, and now earnestly praying, that the day may not be far distant when the multitude of those who shall be able to “sing unto the Lord a new song” may be such as “no man can number,” he cheerfully leaves the result of his labors in the hands of an impartial public.